Oriented Strand Board (OSB) is a widely used, versatile structural wood panel. Manufactured from water-resistant, heat-cured adhesives and rectangular shaped wood strands that are arranged in cross-oriented layers, OSB is an engineered wood panel that shares many of the strength and performance characteristics of plywood. OSB's combination of wood and adhesives creates a strong, dimensionally stable panel that resists deflection, delamination, and warping; likewise, panels resist racking and shape distortion when subjected to demanding industrial applications. 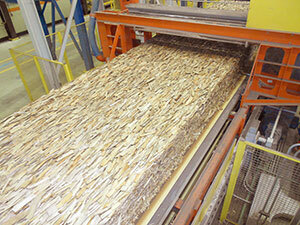 Relative to their strength, OSB panels are light in weight and easy to handle and machine. OSB is produced in large, continuous mats to form a solid panel product of consistent quality with no laps, gaps, or voids. Finished panels are available in large dimensions and a variety of thicknesses. 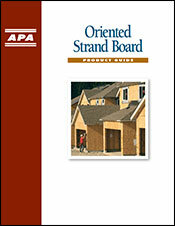 APA OSB products are exempt from the leading formaldehyde emission standards and regulations. Learn more.